Young voters like me energetically support climate friendly policies but are notorious for poor voter turnout. In order to bring attention to climate concerns, that may otherwise be seen as unimportant to constituents, it is essential to speak up. That’s why I took an early morning train from Philadelphia to Washington DC to speak directly to my representatives in Congress. While in Washington DC, I had the pleasure of discussing the concerns and values of young voters with Pennsylvania Congressional staff. We made a conscious effort to reach out to both sides of the aisle, and met with Congressman Dwight Evans, Senator Bob Casey, and Senator Pat Toomey. I was able to see, firsthand, how Defend Our Future has a direct impact on where our representatives stand on climate issues. 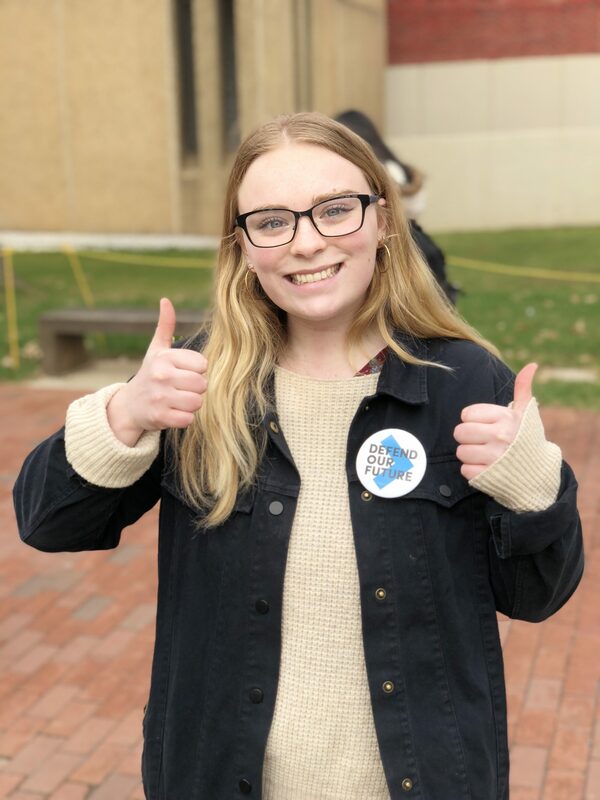 Although advocating for policies that help fight climate change may seem like an obvious stance, it is crucial for young people to voice their concerns so our elected officials can truly represent their constituents. In a marathon of office visits on Capitol Hill, we met with Senator Bob Casey’s, Senator Pat Toomey’s, and Congressman Dwight Evans’ staff members. During these visits we were treated with the utmost respect, each staff member taking into consideration our presence as concerned constituents. They listened to our concerns about the Trump Administration’s proposed rollback of the Bureau of Land Management’s methane waste rules and the Obama-era clean car standards, which would both be disastrous for public health and the environment. Meeting with both Republicans and Democrats was a great way to hold both parties accountable on issues that affect our environment, while confirming that we all want clean water, air and public land for Pennsylvania residents. On my train ride home, passing over the beautiful Chesapeake Bay, my efforts were validated. I owe it to Defend Our Future and the Environmental Defense Fund for allowing me to take part in important environmental advocacy. Nicole is a Defend Our Future Intern and rising senior at Temple University.